Contenders 4; Couples who train together, fight together! In a first for Shock N Awe we have a husband and wife team about to make their debuts and we can’t wait! Don’t panic, they aren’t fighting each other! We’ve had siblings fight on the same card, and even two sets of brothers fight each other at Shock N Awe 28 but a husband and wife compete on the same show, both making their debuts? That’s a first for us! 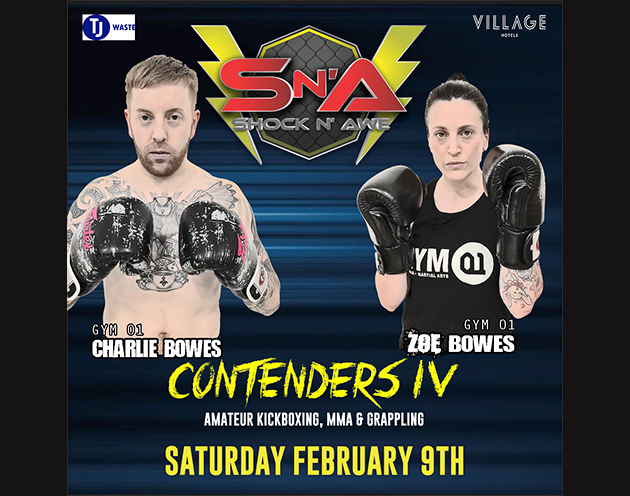 Charlie and Zoe train out of Gym 01 in Portsmouth and have been preparing since before Christmas for their debut Kickboxing bouts. The event, held at the Pyramids Portsmouth is a familiar venue for both of these two especially as it’s a popular music venue, somewhere Charlie hopes to play one day with his award winning band, Seething Akira. Tickets are available HERE for £25 in advance, or off of the fighters directly. They will be £30 on the day, doors open at 3pm and first fight will be at 4pm.